Just a few weeks after the initial announcements of the new Kindle Fire HDX, news just in that Amazon’s latest tablet has started shipping in the UK. With models starting at £329.00 for the 16GB WiFi version up to £489 for the 64GB WiFi/4G version. 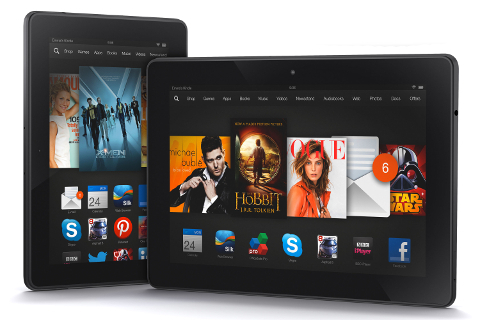 The Kindle Fire HDX 8.9 4G LTE will be released on 13 December and that can also be pre-ordered now. Astonishingly light design — at just 374 grams, the 8.9″ Kindle Fire HDX is the lightest large-screen tablet, 34% lighter than the previous generation. The 8.9” Kindle Fire HDX is £329. Kindle Fire HDX 8.9″ has the highest resolution (2560×1600) and the best pixel density (339 ppi) of any Kindle Fire tablet, providing an incredible multimedia experience. The HDX display features over four million pixels for vivid, lifelike images that go beyond standard HD.